Eliot Arms, Tregadillett | Launceston Then! 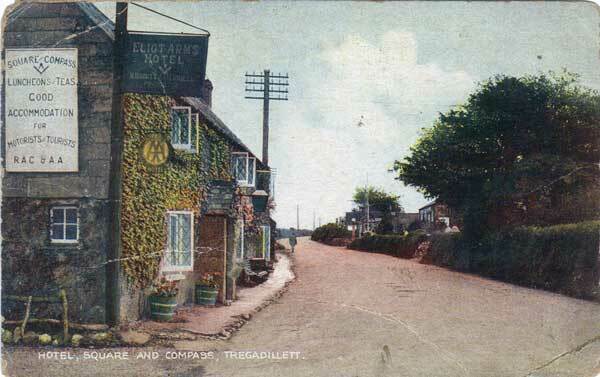 The original building was built in the 14th century and it became a coaching inn during 1625. The Inn fell into disarray in the early 19th century, becoming a blacksmith’s shop, until 1840 when it reverted back to a pub and the second name ‘Eliot Arms’ was added. The French POW’s lodge is thought to have existed for five to seven years of the war and this is shown by two certificates of ‘The Lodge Consulate Maconne’ dated 1762 and 1763; one in French and one in English, issued to Robert Martin, organist at St Mary Magdalene Church. Both certificates had French signatures, five on the one of 1762 and four on the other dated 1763. Several of the Frenchmen joined the Dunheved Lodge, which must have existed during 1756-1773. The Eliot is reputed to be haunted by a not unfriendly ghost which is said to have been seen by customers and staff in recent years. Mr T Richards, landlord of the Eliot Arms, Compass, made an application to the Bench for an hours extension on the occasion of the Polyphant Cricket Club dinner given by Dr Serpell. The application was granted. The Post & Weekly News, 11 February, 1911. 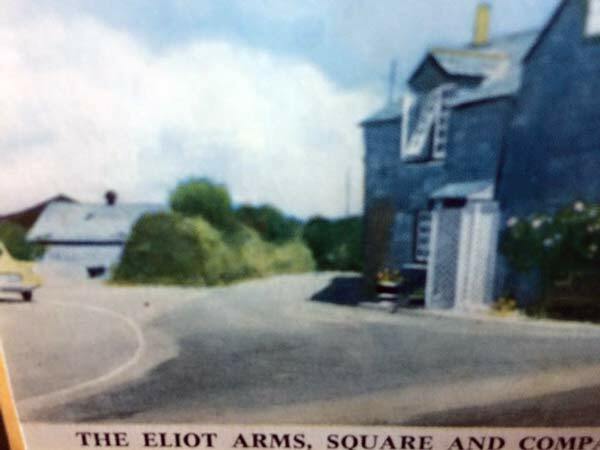 Eliot Arms c.1950’s. Photo courtesy of Trevor Hume.